Meditation is essentially a technique that involves focusing one’s mind to achieve the ultimate goal of a clear and calm emotional state. Through neuroplasticity, meditation rewires your brain, increasing neuroplasticity even further. The calm becomes deeper over time. It’s a practice that has been traced in texts back to ancient India in 1,500 BCE. More recently, meditation is something that’s been practiced by millions of people all over the world and not just in a religious setting either. Some people use meditation as a way of reducing stress or anxiety, while others use it to ease pain or increase their wellbeing. Once you get the hang of it, meditating can be both relaxing and revitalizing. The problem is that until your body’s had a chance to get used to sitting in one position for an extended period of time, it can be rather uncomfortable. And, that’s where meditation chairs come in. A meditation chair has been carefully designed to enable you to sit upright in such a way that very little strain is put on your back. It keeps your spine nice and straight without too much effort from you. With a meditation chair, you can simply sit down, relax, and begin to mediate without the added stress of trying to keep a good posture. 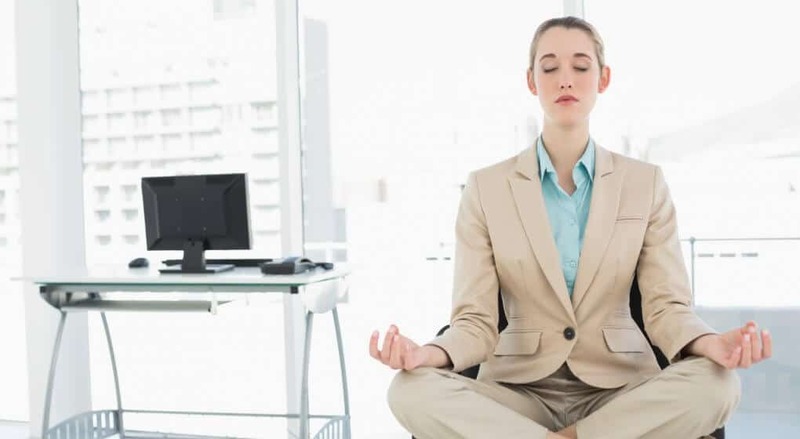 In this article, we’ll take you through some of the benefits meditating can bring as well as what to consider when buying a meditation chair. We’ll then briefly run through how to best use a meditation seat, before finally, showing you some of the best around at the moment. This is one of the most common reasons as to why people turn to meditation. When people are put under physical or mental stress, their body produces excess amounts of cortisol within the body. This increased level of cortisol can play havoc with the body, causing symptoms such as depression and anxiety as well as disruptions to sleep and cloudy thinking. Meditating helps to reduce the cortisol level within the body, and therefore reduce some of these symptoms. Anxiety and stress often go hand in hand. So, if you can reduce stress by meditation, there’s no reason as to why you can’t relieve your anxieties as well. Many people who suffer from phobias, panic attacks or obsessive-compulsive disorders use meditation as a way of focusing their mind on being in a much calmer place. Brain changes alter the neurochemistry for more consistently positive moods. Meditation reduces activity in the amygdala, one of the main fight or flight centers. It increases gray matter thickness in the centers associated with positive emotions and that thickness increases over time with practice. For some people, meditation can lead to an increase in confidence and a better outlook on life. It promotes measurable changes in those areas of the brain relating to optimism and positive thinking. A review of several studies suggests that this is because meditation decreases certain inflammatory chemicals called cytokines, which are known to have an effect on one’s mood and lead to depression. Meditation comes in many forms, some of which can help you develop a much stronger sense of self-awareness. It can help you gain a much greater awareness of the way you think and ultimately help you improve your thought patterns. Most meditation involves focusing and by practicing it regularly, you will soon notice an increase in both the length and strength of your attention. Some people have even overcome addictions through the use of meditation. It can help you learn to increase your willpower, focus your attention elsewhere, and better control addictive behaviors by relating to them in a non-reactive way. Meditation also helps regulate serotonin, acetylcholine, and dopamine, too. When it comes to mediation chairs they will either come with or without a back. Anyone who suffers from back problems should most definitely choose a chair with a back as this will give much better support. Mediation is about cleansing the mind, body, and soul and making oneself feel better, not worse. Don’t suffer unnecessarily. Another important factor to consider when buying a meditation chair is whether to go for a model with or without legs. A legless meditation chair is a much better option if you’re going to be transporting it around. Some models with legs are quite bulky and are like a piece of furniture and for that reason are better suited for use within the home. Meditation chairs vary greatly when it comes to the type of material they're made from. However, the most popular options tend to be those that are vegan-friendly and made out of natural materials such as wood or organic cotton, or hemp. If you’re just going to be meditating at home, portability won’t be too much of a concern for you. However, if you’re planning on meditating outdoors or in a group session somewhere, you’ll want to look for a chair that’s relatively lightweight and easy to transport. Another thing to think about when buying a meditation chair is where it’s going to be stored when not in use. While some meditation chairs fold up into quite a small package, others are rather cumbersome. So make sure you think about this when making your purchase. While it’s never a good idea to get too hung up on price when buying something that will benefit you as a whole, it is still something that needs to be considered. Just be aware that the price of mediation chairs varies considerably across the board. 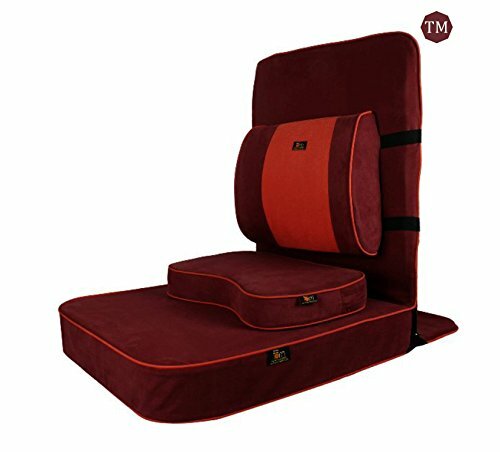 If you are on a bit of a budget, then you may want to consider a backless meditation chair as this will be your cheapest option. Hopefully, by now you will have a much better idea as to what to how a meditation chair can benefit you personally, as well as some of the things to consider when buying one. In this section, we’ll share with you some top tips on using a meditation chair to help you get the best results. This is one of the most important things to remember. However tempting it is, you should always avoid leaning back into your meditation chair too much (if it has a back). Maintaining proper spine alignment is by far the healthiest way to sit. To do this, make sure your spine is just touching the back of your chair. You want it to be supported without having to really lean into it. Until you get used to sitting in the same position for extended periods of time, you may find your hands and arms ache a little when first meditating. To avoid this, try and find a position that will allow you to support your hands and arms. Some people find resting them on their thighs or across their lap works best. But it is an individual preference, and it’s more a case of finding what works best for you. Some forms of meditation require you to remain supported throughout the whole session. Unfortunately, not all meditation chairs are designed for this purpose. However, this can easily be achieved by placing props such as towels, blankets, or yoga blocks under your feet, ankles, knees, or thighs. Once you have your new meditation chair in place, spend some time getting used to how it feels when seated. Adjust both the chair and your position until you find a position that’s comfortable and sustainable. This backless, legless seat might not look much at first glance, but just wait until you sit on it. The Alexia Meditation Seat is one of the plushest and most comfortable meditation seats you’ll find (in our opinion). Its custom design gives you all the support you need in all the right places, making meditating for long periods perfectly achievable. It’s lightweight, portable, and is also one of the best around in terms of quality. It’s available in a whole range of subtle or funky colors and as either a vegan leather or real leather option to suit all tastes. All-in-all, the Alexia Meditation Seat fresh and funky, and because there are so many options, there’s bound to be something for everyone. The only thing to note with this seat is that it is at the top end of the price range. But, considering all you’ll be getting for your money, it’s still a great investment. If you’re looking for a meditation chair that’s simple, yet elegant, and won’t cost you a fortune, then you’re in luck. The Tatami Meditation Backrest Chair is a great choice for pretty much anyone. 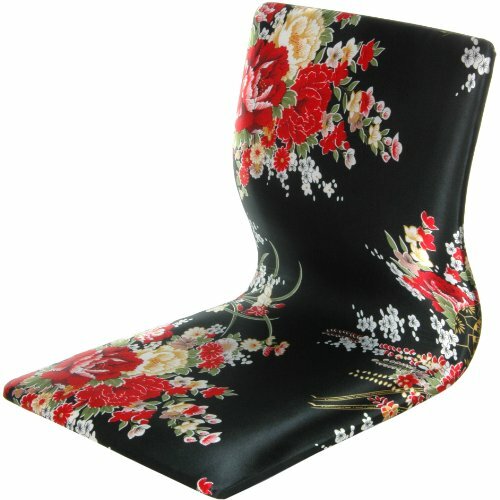 Draped in a beautiful hibiscus pattern, this chair would look fantastic just about anywhere. It has a full back, meaning it’s supportive enough for those with back problems and it’s lightweight, meaning it’s ideal for those who need to store it away. The frame itself is quite rigid, so while it’s great for providing lumbar support, it’s not so great for transporting around. And while it is quite a firm seat, it’s also padded enough to be comfortable when sitting cross-legged. 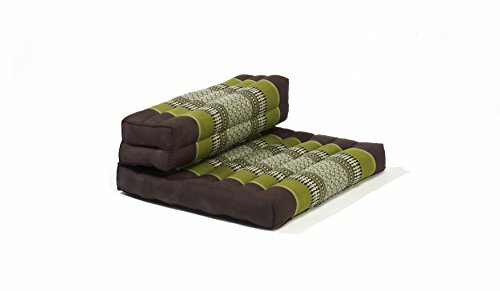 The My Zen Home Dhyana Meditation Cushion is an affordable and versatile meditation cushion that’s available in a wide range of colors. It’s suitable for both cross-legged meditating or meditating in a bent position. Whichever method you choose, simply fold or unfold the rows as you need them, and away you go. When you’re finished just fold it back up and store it until next time. Weighing in at just 4 pounds, it’s very lightweight and easy to transport around. The only real downside I can see with this meditation chair is that’s a little on the firm side. That being said, it’s not uncomfortable and will still provide ample cushioning for all your meditating sessions. 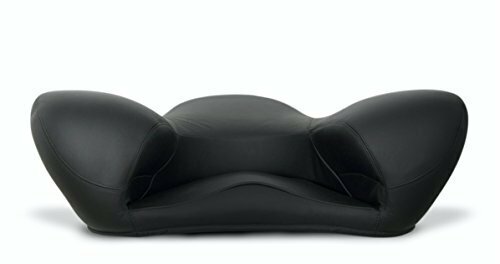 Not for the faint-hearted, the Friends of Meditation Buddha Meditation Chair is one of the more pricier models on this list, but it’s also one of the most innovative. Designed by a registered Yoga teacher and Osho Meditation Facilitator, its ergonomic frame helps you achieve the perfect pose with ease, each and every time you use the chair. It also provides excellent lumbar support for those suffering from back pain. This meditation chair is suitable for anyone up 6ft 2”. It looks great, has adequate padding and it’s available in 4 different colors. The heavy-duty foam is firm and might take some getting used to. And, there are a few parts to this chair, so you will need to set aside some time to set it up. Other than that, it’s a great buy and one that we would highly recommend to anyone. As you can see, meditation chairs come in all kinds of shapes, sizes, colors, and materials and it’s definitely worth doing a little research to see what will work best for you. Out of all of the above chairs, our favorite has to be the Friends of Meditation Buddha Meditation Chair. It’s functional, looks fabulous, and provides great back support. It may be a little on the expensive side, but you’re getting quite a lot for your money really and for that reason, we feel it’s definitely an investment worth considering.